Can I Give My Dog Raw Carrots? Most kids would live on macaroni and cheese, sweetened applesauce, and dinosaur-shaped chicken nuggets if we allowed them to structure their own diets, but there are a handful of fruits and vegetables that are often considered child-friendly. The quintessential childhood vegetable is the baby carrot. Raw carrots are bright enough to keep them interested, sweet and crunchy enough to prevent them from gagging, and portable and resilient enough to withstand several hours shoved into the depths of a backpack. Though many kids go for shamefully long periods of time without eating anything green and leafy, most school-age children will eat raw carrots readily enough. Raw carrots are some of the least threatening vegetables readily available in supermarkets across the country. They have an agreeable flavor and texture, and they are mild enough that they generally do not upset our stomachs. They are everything we look for in a kid-friendly vegetable. They also happen to be everything we look for in a canine-friendly vegetable—after all, many of us think of our pets as children, and we often have to employ similar strategies to convince them to eat what’s good for them. Baby carrots are perfect for kindergarteners, but what about canines? Can dogs have raw carrots? 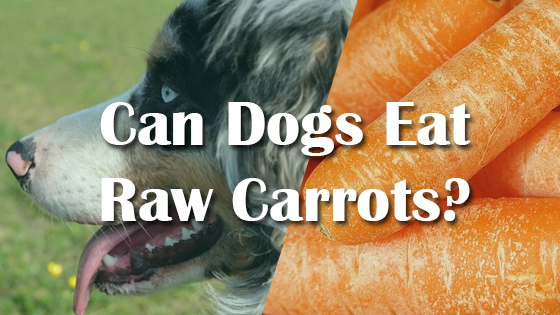 Yes, dogs can and should eat raw carrots! This childhood favorite is also a canine favorite, and most dogs are thrilled to receive a chunk of raw carrot as a treat. These gently sweet, crunchy veggies are just as exciting to many dogs as highly processed junk food, which makes them an excellent snack to have on hand during parties, family dinners, or other events—if you have some carrots ready to toss to your pooch while everyone else eats chips, they won’t feel left out. Do keep in mind, though, that carrots are high in fiber, so feeding them to Fido in large amount can cause bloating, upset stomach, and gas. Thanks to their nutrition and relatively low calorie content, raw carrots are one of the healthiest treats you can give your dog. In fact, these are one of the few foods that can benefit your pup’s health before they even have the chance to swallow a mouthful! Because raw carrots are crisp and crunchy, they are also great for dental health. Chewing on chunks of raw carrot can scrape plaque and other debris off your dog’s teeth, decreasing their risk of cavities. All that chewing also stimulates saliva production, which also keeps your pet’s mouth cleaner. Even if you feed your dog raw carrots regularly, you should brush their teeth! Dental hygiene is an often-overlooked aspect of overall health, and many dogs suffer as a result of poor oral health. Many canines suffer from cavities, gum disease, and other oral infections that cause severe pain and difficulty eating. In some cases, bacteria from the mouth can get into the blood stream and spread to other organs, causing severe organ damage. Brushing your pup’s teeth is necessary, but raw carrots are a great way to improve oral hygiene between brushings. Raw carrots are also quite nutritious. These colorful vegetables are loaded with carotenoids, potassium, and fiber that can support long-term health. The carotenoids in carrots have powerful protective properties; they may be able to reduce your pet’s risk of heart disease, insulin resistance, diabetes, and some cancers. Dietary fiber can help regulate digestion—since it absorbs water, it can aid in alleviating both constipation and diarrhea—as well as weight loss. Because fiber itself contains zero calories, it can take up space in your dog’s stomach without actually providing any energy. So, if your dog fills up on high-fiber foods like carrots, they can keep their belly full while eating a fraction of the calories. Just remember that your dog should never go on an all-vegetable diet. 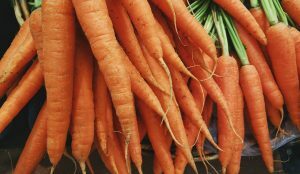 While carrots are a great dietary supplement, they are not nutritionally complete foods, and any dog who relies heavily on them will almost certainly develop nutritional deficiencies. If your dog is overweight or obese, talk to you vet about putting together a healthy and effective weight loss plan. Raw carrots are great, but all that fiber can cause problems in large quantities. Most medium or large dogs can eat one raw carrot per day without any negative side effects, but smaller dogs may be better off eating baby carrots or carrot sticks. If your pet eats too many carrots, they may suffer from bloating and discomfort. As with all high fiber foods, make sure your pet has access to plenty of water—eating a lot of fiber without getting enough water can cause constipation. Overall, raw carrots are an excellent food for pets. They are great for dental health, they can help with weight loss or weight maintenance, and they are delicious. Just don’t overdo it, because too many carrots can upset your pet’s stomach. Can Dogs Eat Raw Fish? Can Dogs Eat Prawns?